Looking to whip yourself into shape the way the pros do? 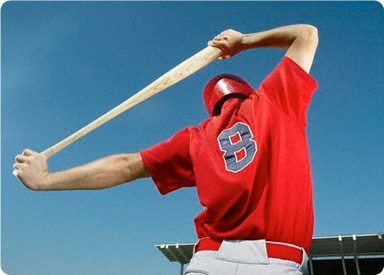 These tips from three Major League Baseball strength and conditioning coaches will help get you into midseason form. First things first: You need to get motivated, no matter what shape you’re in, says Baltimore Orioles strength and conditioning coach Jay Shiner. “The most disheartening thing to see is when someone feels defeated and just comes into camp and goes through the motions.” Even top-notch athletes struggle with inspiration, and lazy workouts can be both ineffective and dangerous. So surround yourself with like-minded and hard-working contemporaries who will push you, says Eric Cressey, who trains MLB players at Cressey Performance in Hudson, Mass. Cressey also suggests measuring yourself against someone in the gym who is stronger and fitter. That way you’re continually challenging yourself. Many novices attempt to build mass too early in the game and pay for it later. A body with big biceps, big legs and a weak core will break down. “You can’t build muscle on a body that’s out of whack,” says Velasquez. In order to minimize the risk of injury, exhaustion and asymmetry, you have to be deliberate about shaping your foundation from the start. Velasquez suggests incorporating quick changes in direction into your movement training, because life isn’t all forward and backward (like it is on a treadmill). Exercises that make sense for your daily physical needs are key. Likewise, longer cardio runs should happen only on recovery days and fat-burning exercises during anaerobic training (2 minutes on, 1 minute of recovery) should top the list. Don’t be afraid to be creative to keep frustration and boredom at bay — the pros aren’t. “I worked with a Hall of Famer who would tell you to get lost if you told him to do sit-ups or leg raises,” says Shiner, “but we asked him to engage his core in a series of yoga poses, and he loved it.” So mix up your routine if you find yourself dreading a workout. Whether you’re fielding fly balls or toning up for Spring Break, our exclusive workout from certified personal trainer Clayton Patrie will help put you at the top of your game. Hold a dumbbell in your left hand. Bend left knee slightly as you lean forward at the waist and raise your right leg behind you in a straight line. Return to start and switch dumbbell hand and leg. Lie stomach-down on a stability ball with palms flat on the floor in front of you and legs straight out behind you, toes shoulder-width apart on the ground. Keeping your legs straight, bring your arms up to your sides and use your lower back to lift your chest off the ball. Your torso should form a straight line with your legs. Hold for a moment and then lower back to start. Place a 15- to 20-inch resistance band/tube around your thighs. Stand with feet shoulder-width apart and hands on hips. Keep a slight bend in the knee as you step wide to the right. Bring in left leg to return to shoulder-width distance. Repeat with 10 steps to the right and then return to start using the left leg first. Lie down with your upper back and shoulders on a stability ball, feet on the floor. Hold a medicine ball and lift arms straight above you. In a controlled motion, swing arms from side to side, rolling the stability ball from the edge of the right shoulder to the edge of the left shoulder. The slower you move, the more the abs work to keep you stabilized. Start with feet four feet apart. Squat down to the right, keeping your weight on your right heel. Your left leg should remain straight. Sit as low as comfortable for one second and then power up and alternate legs. Depending on your skill, choose a box between 15-30 inches high. Start in the squat position about 12 inches from the edge of the box. Power off both legs, landing in the middle of the box in the half-squat position. Return to start.